Mosaics constitute a shared cultural inheritance from the Roman and Byzantine world throughout the Mediterranean region. Due to the vast number of mosaics presently at risk, there is an urgency to determine common problems, to promote efforts to better conserve these important historic documents and artistic creations of the past.Mosaic conservation is a practice as old as the making of mosaics themselves. Today one can still find ancient mosaics with patches that were made as part of maintenance when the floors were still in use. In more recent centuries, restoration has been widely practiced on objects of antiquity, including mosaics. And from the first decades of the twentieth century, we have fine examples of restorations. 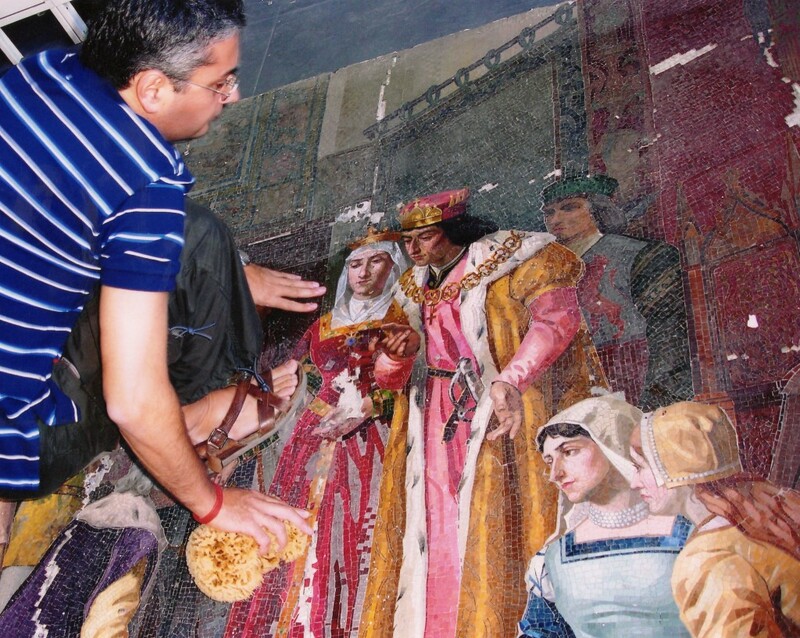 The use of lime-based mortars has allowed the development of in situ (on-site) reinforcement consolidation and has furthered the practice of maintenance in situ when possible.With almost 20 years’ experience, Enzo is highly specialized in the conservation, renovation and restoration of antique mosaics. The most common procedures concern: consultation, cleaning, conservation, consolidation and restoration, backfilling, lifting and transfer to a museum, lifting and re-laying in situ, and consolidation in situ. Through the use of a special technique, it possible to relieve the mosaic of 70% of its original weight. The procedure involves injecting special mortars into the mosaic using syringes in situ, consolidating the piece, lifting and removing it from its original back and relocating the mosaic to a new, lighter surface. Most of the old mosaics restored in the last century were mounted on weighty concrete and iron structures, very heavy and difficult to transport, which made it extremely difficult to move them. In fact, the mosaic and its back can weigh up to 650 pounds (300 kg) per square meter.Enzo removes the heavy back and reinstalls the mosaic onto a light, inflexible surface of aluminum honeycomb. This process eliminates roughly 70% of the total weight of the piece, with obvious benefits in terms of transportation and ease of delivery. When an old mosaic is found in an archeological site, or when a client wants to remove a mosaic from his floor or wall and the he wants to reinstall it in a new location, Enzo uses specific swords to extract it from its original location and then relocates it to the new destination site. 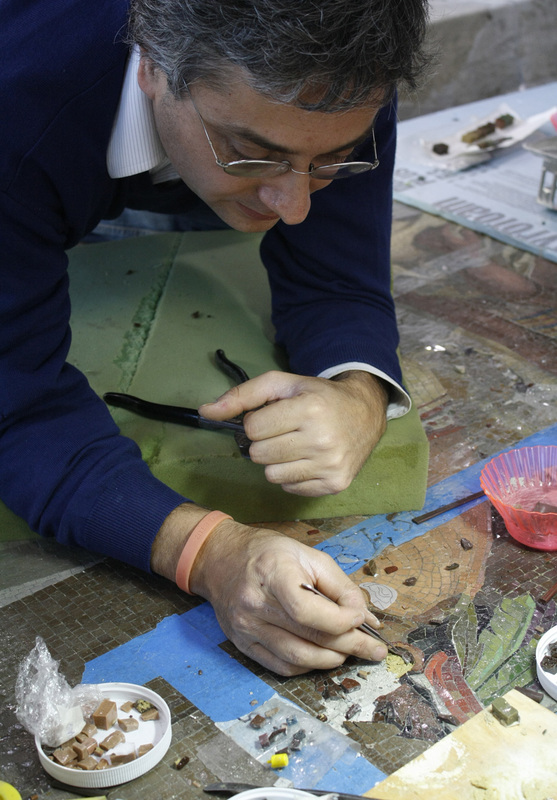 Enzo Aiello is highly specialized in Restoration,Consolidation, Conservation,Detaching and Re-installation of ancient mosaics, including Ancient Roman Mosaics from II century b.C. to IV century a.D,Ancient Byzantine Mosaics from IV century a.D. to VII century a.D, Middle Age Mosaics,Old Mosaics from VIII century a.D on up to contemporary mosaics. First preparatory layer which is made of large stones laid on the ground, previously leveled and rammed. This layer only exists if the mosaic has been constructed on a natural soil. Second preparatory layer which is spread over the statumen. This layer is made of a lime mortar with large aggregates. Third preparatory layer which is spread over the rudus in a thinner layer. The nucleus is made of a mortar with fine aggregates. Fourth preparatory layer of mortar which is very rich in lime, and thinly applied in small sections over the nucleus. Tesserae are inserted in this layer before the mortar sets. Layer which consitutes the mosaic surface and is composed of tesserae and mortar filling the interstices between them. Application of a material (natural or synthetic product) to restore cohesion to preparatory layers. Application of material (natural or synthetic product) to restore cohesion to individual tesserae. Application of a mortar along the edges of a mosaic. Application for stability of mosaic of a mortar and/or other materials in an area of loss of the mosaic surface. Application of a mortar in the interstices between the tesserae. Reduction or removal of microbiological organisms by mechanical or chemical means. Removal of extraneous substances from the mosaic surface, with or without water, and with tools such as sponges, brushes, scalpels, wooden tools, dental instruments, etc. Once the mosaic is detached,removal of the mortar left on the back of the mosaics with wood chisels of various sizes, small saws, rasps, stainless steel brushes, natural and synthetic hard-fiber brushes, scalpels and bisturi ,vibroincisors or electric saws like Makita power cutters . The aim is to remove all residual material of the mortar layers down to the thin stratum of the setting-bed as delicately and gradually as possible.Manual tools, which allow greater control over the depth of the work to avoid damaging the underside of the tesserae (particularly the very fragile glass tesserae), are therefore preferred.